Enrollment in these plans is automatic based on the Hall in which the student resides. The cost of the plan is included in the housing contract each semester and will not be billed as a separate invoice. Unused Celts Dollars roll-over from Fall to Spring, but expire at the end of the Spring semester. 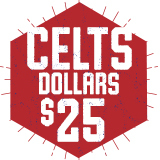 $25.00 Celts Dollars Add-On: Any Amount ($25 Increments) Add To Cart "Opens a dialog"
Rolls over from fall to spring!